Last Chance Nordic Ski Club parents provide free Nordic ski lessons for children, ages three to twelve years old. This is a chance for your kids to learn and improve their nordic (cross country) skiing skills. Classes are held on Saturdays in January and February. Pete Behrends and David Tuss will be leading the LCNSC youth ski program again this year. We welcome additional volunteers, especially for the ski dates. Some ski rentals are available. Ski rentals and sign up will be at 10-11:30 am on Saturday, November 10, at the Lewis and Clark Library Large Meeting Room. We could use 1 or 2 volunteers to help with the rentals. Please contact Pete at petebehrends@yahoo.com or 406-461-4974 for more information or if you are interested in assisting with classes or the rentals. The program runs on Saturdays at 10:00 a.m. Lessons will be at either the Bill Roberts Golf Course or the MacDonald Pass Ski Trails, depending on snow and weather conditions. A weekly update on the location and other details will be posted to the website and email on Fridays before the class. Children three-to-six years of age will ski for approximately thirty minutes and ages seven and older will ski for about an hour. Beginning skiers must be accompanied by a parent/designated adult who stays with the group and helps as needed. Classes will take place in Carl’s Play Area (see map), which is up the hill and slightly beyond the Patrol Cabin, about 0.4 kilometer from the Parking Lot (see map). Please leave the parking lot by 10:00 a.m. to be on time. Intermediate and advanced skiers (both classic and skate) will meet at Carl’s Play Area at 10:00 a.m. This means that they need to leave the Parking Lot (see map) by 9:45 a.m. to start their lesson in the play area by 10:00 a.m. Lessons will start in the play area and then move out onto the nearby Access Ski Trail. Advanced skiers may participate with classic or with optional skate skiing equipment. If possible, bring in a thermos of hot water and a snack to share for apres ski hot chocolate. You may leave your thermos at the Patrol Cabin, about 0.4 kilometer from the Parking Lot. If cold or wind forces us to cancel classes, a cancellation notice will be posted on this website (https://lcnsc.org/youth-program) by Saturday at 8:00 a.m. We usually cancel classes when temperatures are less than 15 degrees F., or when there’s a strong wind. Are just that, volunteers, who love to ski and share their love of skiing with your children. Please help your child’s teachers any way you can; and we’re always looking for volunteer teachers. If you are interested in teaching, please contact Youth Skiers program coordinator Pete Behrends. Due to the forecasted subzero temperatures and windchill, we are going to cancel the kids ski for Saturday, February 9. That said, there’s plenty of snow and both Mac Pass and the golf course should be great skiing. I’d encourage everyone to find a window of reasonable weather and get out there. This marks the last youth class for the season, as key instructors are unable to reschedule the class for the following weekend. Thanks everyone for your participation and enthusiasm this year! Ski rental returns will be in later March, I’ll send an update in a few weeks. Youth skiing will meet this Saturday, February 2, at 10 am at the MacDonald Pass ski trails. Plan to meet in the parking lot and we will split into groups depending on age and experience. 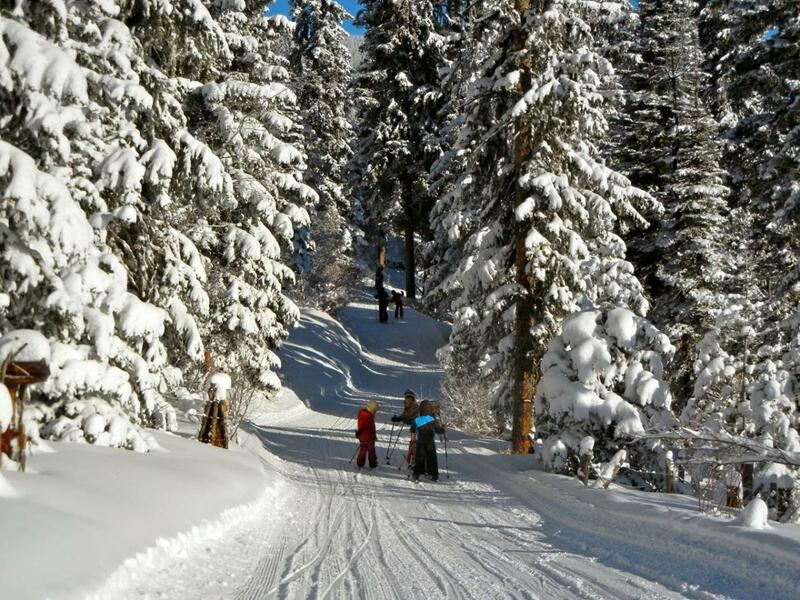 Please bring a sled to help the youngest skiers get to and from the cabin. This will be our second-to-last ski group for the season. It’s been great to have so many enthusiastic kids and parents participating! Tomorrow looks like it will be a nice mild day for skiing (with plenty of snow on the trails) before the next snow storm arrives in the evening. Please forward this notice on if I’ve missed anyone and contact me with questions. Youth skiing will meet Saturday, January 12, 10am at the MacDonald Pass ski trails. Plan to meet at the parking lot. Mac Pass should be good skiing with this weekend with some new snow earlier this week and mild temperatures. Please dress appropriately and bring a thermos of hot water and a snack if you wish. David and I will provide hot cocoa mix and light snacks. Please forward this notice on if I have missed anyone. Please contact Pete Behrends (406-461-4974, petebehrends@yahoo.com) with questions. Youth skiing will meet Saturday, January 5, 10 am, at the MacDonald Pass ski trails. Plan to meet at the parking lot. Mac Pass should be nice skiing with this weekend with plenty of snow.